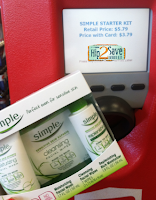 Right now at CVS you can get Simple Face Care Starter Kits for only $0.54! These are great for stocking stuffers, gift baskets, and more! As low as $2.16 or $0.54 a piece!